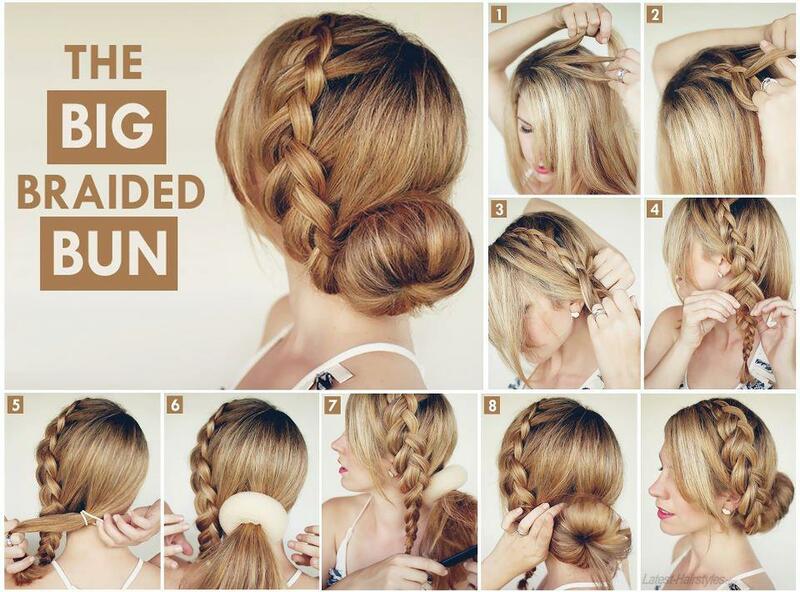 Here is a wonderful hair tutorial that is a twist to the traditional bun. It's chic and sophisticated and pretty simple once you get the hang of it. 1) Part the hair on the side of the crown. Pick three strands that are in the center of the crown. Leave the front hair for a bang effect. 2) Start braiding the three strands. 3) Begin to pick up more hair from the same side as you go along. Leave out the bangs portion. Tie it with a rubber band when you reach the end. 4) "Open" up the middle of the braid as seen in the picture. 5) Tie the other side with a rubber band. 6) Put a small or medium size (according to your hair thickness) hair sponge. 7) Tease the hair that is below the sponge. 8) Take the hair from the middle and flip it over the sponge. Pin it down using a bobbin pin. Do the same process for the rest of the hair. 9) Finish the look by brushing your bangs near the braid. You can personalize the look by adding some nice hair jewelry.